1. Meet your nutritional needs. A varied, balanced diet provides the nutrients you need to avoid nutritional deficiencies. 2. Prevent and treat certain diseases. 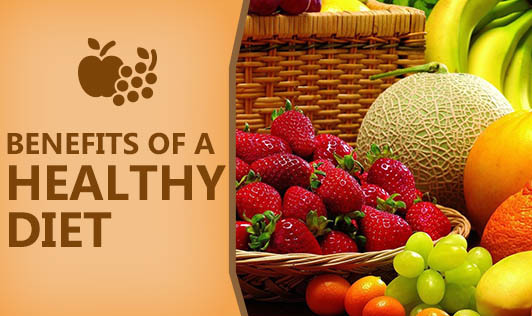 Healthful eating can prevent the risk of developing certain diseases such as cancer and heart disease. It is also helpful in treating diabetes and high blood pressure. Following a special diet can reduce symptoms, and may help you better manage an illness or condition. 3. Enjoy life. Food is the mainstay of many social and cultural events. Not only does it provide nutrition, it helps facilitate connections between people. Cooking fresh, healthy meals can also be an enjoyable way to spend time, either on your own or with others. 4. Feel energetic and manage your weight. A healthy diet can help you feel better, provide you with more energy, and help you fight stress. 1. Drink lots of water. Keep bottle of water near you while working, watching TV, etc. 2. Eat five portions of fruit and vegetables every day. 3. Never skip breakfast. It is the most important meal of the day. 4. Keep a supply of healthy snacks to hand. This will stop you from eating an unhealthy snack when hungry. 5. Remove all visible fat from food before you cook it - take the skin off chicken and trim the white fat off any meat. 6. Limit stimulants such as caffeine, alcohol and refined sugar. 8. Only eat things you like the taste of - find what works for you and don't force yourself to eat things just because they're good for you. 1. The most important rule of healthy eating is not skipping any meal. Skipping meals lowers your metabolic rate. The normal eating includes 3 major meals and 2 snacks between meals. 2. Learn simple ways to prepare food. Healthy eating doesn't have to mean complicated eating. Keep meal preparation easy, eat more raw foods such as salads and vegetable juices, and focus on the pleasure of eating healthy food rather than the calories.